# The Talmud clearly states that we should light Chanukah candles outdoors. So why have most Jews been lighting inside for the past thousand years? # We don't recite a full Hallel on the last day of Pesach since Hashem's creations perished in the Yam Suf. So why do we say the full Hallel on Chanukah, when many Greek lives were lost? # In what way is the commandment to be joyful on Purim fundamentally different from the similar mitzvah on other holidays? # Under what circumstances may a woman be motzi men in Kerias Megillah? 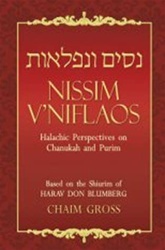 In this penetrating sefer, Chaim Gross, talented writer and longtime talmid, faithfully transmits Rav Don Blumberg's shiurim on these topics and others, with a breathtaking tapestry of halachic give-and-take. 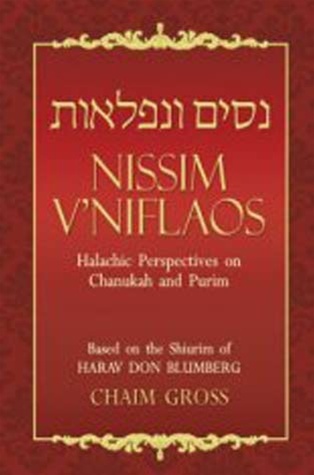 Each chapter explores the essence of Chanukah and Purim through the prism of halachah, offering a fascinating glimpse at the halachic process through the centuries.